SDA Tithe sent to Pope | What's In The News? In one statement in this letter they say “Seventh-day Adventists are not members of the National Council of Churches” but in the very next statement they say “We are cooperating members in certain areas.” And then they move on as if they said or did nothing wrong. But from what I understand, the reason the letter was sent had to do with them funding the NCC with SDA funds. And as we just saw in the last sentence, they said they did not do that. And so, did the lie? Notice this. In this letter it clearly says the SDA church does in fact have voting abilities which means they are members of the NCC proving they lied on one count. But did they lie on the second count? 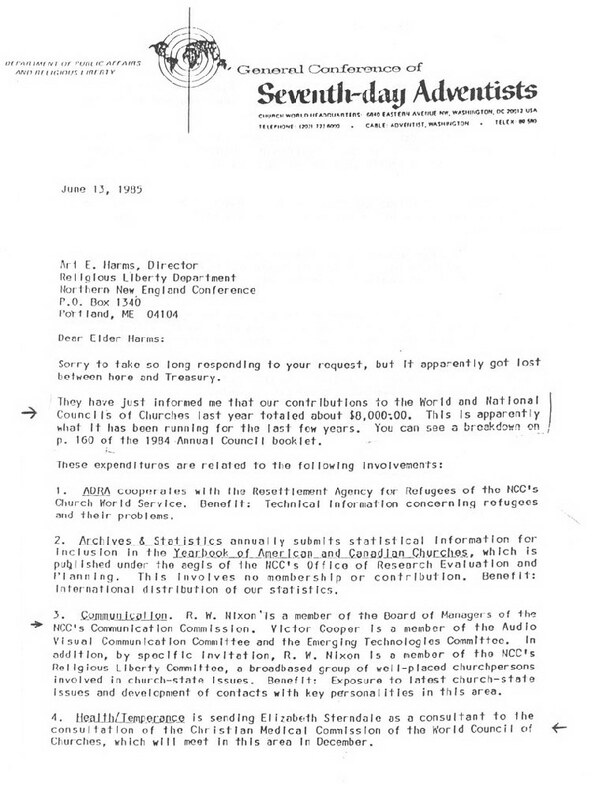 It also stated that in 1959, and by the way that’s 8 years before they were asked about it in the previous letter from 1967, which means it was common knowledge by now in the GC, we see they did in fact send $6,700 to the NCC. And if you notice the NCC shows how they hid certain truths in the 1967 letter wherein they said they had non-voting associations with the NCC. But the NCC says yes, they had membership voting abilities in some areas and nonvoting abilities in other areas. Which means the letter sent in 1967 hid the fact that they did have voting membership in some areas. Also notice this letter from 1970 from the NCC wherein they admit the SDA church “is a related agency cooperating in various communities. In fiscal year 1969 this body (the SDA church) contributed $5,950 to the DOM project.” And so again we see they lied about using SDA money to fund projects of the Vatican inspired NCC. But it gets worse. Now yes, some may say it’s no big deal that the SDA church sends money to the NCC in America, which of course the Bible says otherwise. But in the same breath they will declare they would never do that with the World Council of Churches (WCC) wherein we all know the Pope was elected the leader of it on June 26, 2000 and just a few weeks ago the Pope moved every so called Christian denomination on earth, along with the Jews, Muslims and Buddhists to acknowledge on camera before all the world that the One World Church was in fact in power under the leadership of the Pope. And so that being said, was the SDA church ever asked if they were funding the WCC? And how did they respond? 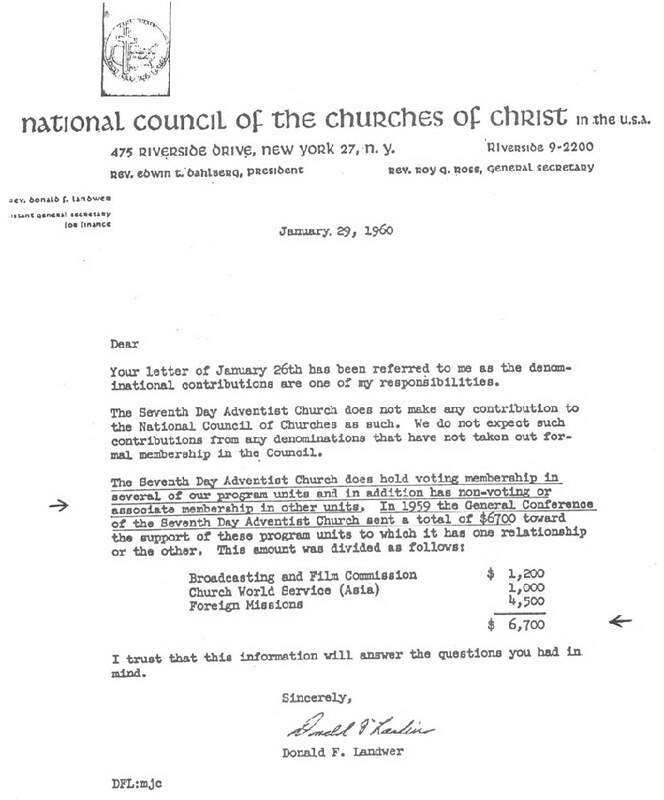 Notice this letter from the GC SDA church from January 5, 1983 where they said “We have no financial relationship with this [WCC] organization. All of the funds that we as a Church receive…are disbursed entirely through our own denominational channels. 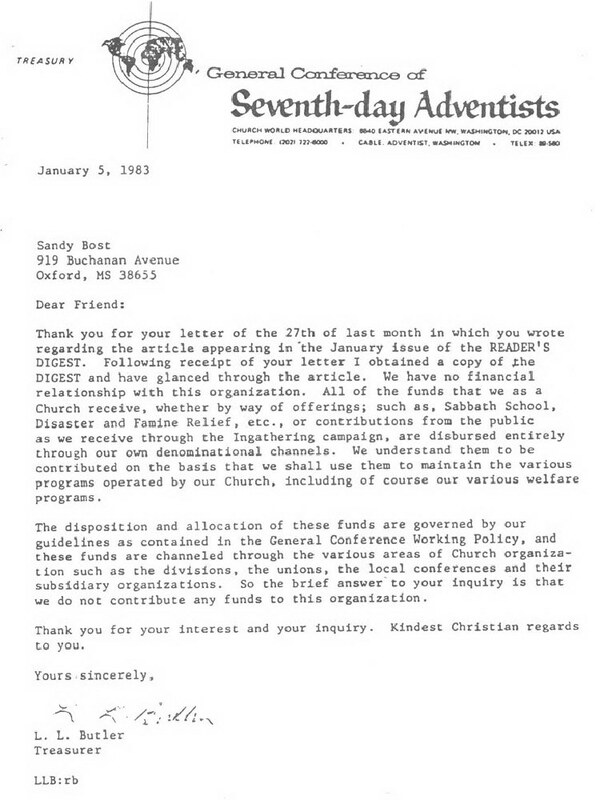 We understand them to be contributed on the basis that we shall use them to maintain the various programs operated by our Church, including of course our various welfare programs… “So the brief answer to your inquiry is that we do not contribute any funds to this [WCC] organization.” –Letter from the General Conference of Seventh-day Adventists, January 5, 1983, from L.L. Butler, Treasurer. Besides the fact they just lied about the money being sent to other denominations via the Pope’s NCC which has all denominations in the USA under their roof, notice that in the Adventist review in 1985 that when speaking of the WCC they said “The Seventh-day Adventist Church…does not pay one cent in support of it.” -Adventist Review, January 3, 1985, p 4. 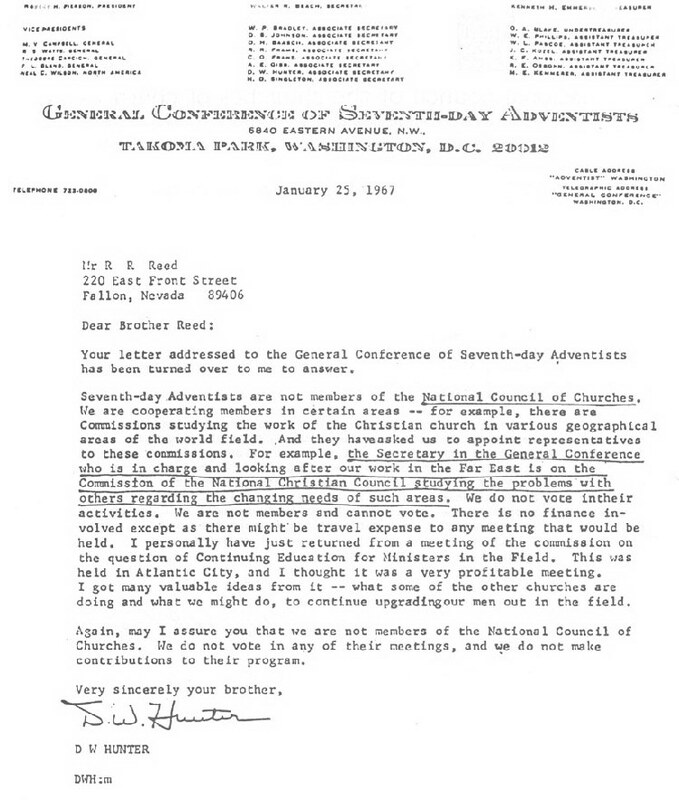 If you go to this page on my other website you will see many more claims by everyone from D.W. Hunter who was the Associate Secretary of the General Conference, to Bert Beach claiming they have no connection with the NCC or WCC years after it was revealed they actually did have connections with the Pope for many years. 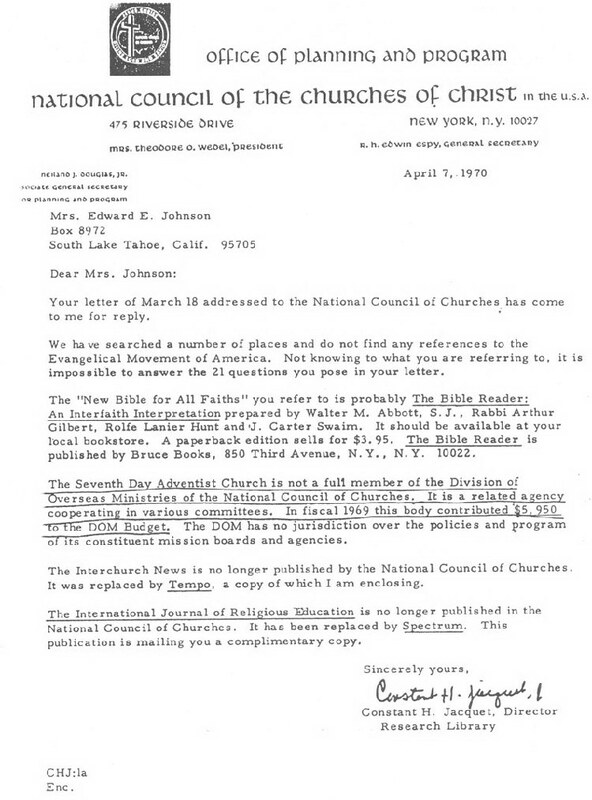 Yet we now know from the SDA Church’s own letterhead as well as that of the letters from the NCC and WCC that the SDA church has had many connections in both the NCC and WCC for decades. Worse yet, they have been sending the money the SDA people give them to the Pope and his cohorts in both the NCC and WCC so that the long prophesied one world church has the financial means and so called spiritual support to come into existence globally just as prophecy predicted it would. And just a few weeks ago the Pope televised that prophesied event before the eyes of every religious leader on planet earth. The one world church is now here! And I am sad to report that the SDA church was instrumental in its coming into power. Next postReal Reason for Climate Change – JESUS IS COMING!